Flat feet are common in children, usual in adolescents and can be a variant of normal for adults. Flat feet can be split into those that are physiological (mild and a variation of normal) and those which are pathological (those that are causing symptoms, will progress and are due to a structural problem or disease process). If physiological flatfeet cause symptoms then they can normally be treated without an operation. This will normally involve the use of orthotics (custom-made scientifically based insoles). This is a service which can be provided by the team at the North West Foot and Ankle Clinic. How does flat feet happen? There are many causes of the pathological flatfoot. These include structural problems with the bones in the arch of the foot, arthritis, diabetes, trauma and nerve problems. You will be carefully assessed for these conditions and a treatment plan developed for you. Non-surgical treatment will involve orthotics and possibly physiotherapy. The goal of surgical treatment is to provide the best possible function for you. Sometimes fusion surgery may be necessary (eg in advanced arthritis). However, if possible, the latest techniques in joint sparing surgery may be offered. This will be thoroughly discussed at your consultation. However the most common cause of the adult new-onset flat foot is a disorder of a major tendon, the tibialis posterior. It affects over 5 million people in USA alone. It is more common in women aged 45 to 65. This muscle has two major functions; holding up the arch of the foot and stabilising the foot for walking. 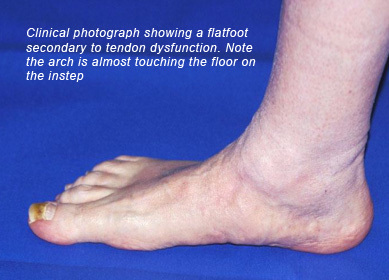 The first sign of an abnormality in this tendon is pain in the instep which is caused by inflammation around the tendon. This is worse on working and can give a feeling of weakness. If the inflammation continues the tendon itself becomes inflamed. This can lead to small and stretching of the tendon, weakening the muscle. As the muscle loses power it causes a flattened arch which later causes the heel and foot to point outwards. It causes weakness and pain on walking, especially on tiptoes (eg when walking up and down stairs). If this deformity is not corrected it will usually lead to arthritis and worsening function. Once arthritis is present, the only surgical option is for fusion surgery. This involves fusing together four bones beneath the ankle meaning that the foot will not be able to move from side to side. However at an earlier stage (if orthotics are not working or are not acceptable to the patient) it is possible to correct the problem with joint sparing surgery. At the very earliest stage the tendon can be freed up and the inflammatory tissue removed. This has a short recovery time with normally excellent results. If the tendon is more badly damaged, the operation involves altering the shape of the heel bone back to a normal position and reconstructing tibialis posterior by transferring a tendon which normally bends the lesser toes (although patients are still able to bend their toes afterwards) to tibialis posterior. This operation has excellent results with up to 95% of patients being satisfied, having pain relief and improvement in their day to day function. The majority of patients find that they are able to wear normal footwear with no need for orthotic insoles once recovery is complete. Contact the North West Foot and Ankle Clinic in Liverpool to discuss flat feet surgery today.